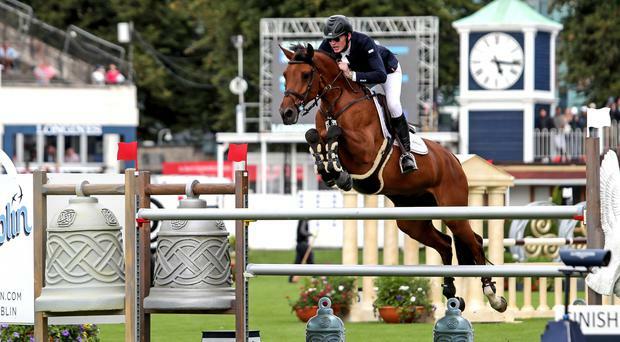 Daniel Coyle, now ranked 30th in the world and a possible Olympic star of the future, obliterated his rivals to win four international classes at the Stena Line Dublin Horse Show including one on Saturday and two on Sunday. The 23 year old from Londnderry scooped over 63,000 euro at the weekend as he showed his exceptional talent on horses owned by his loyal sponsors, the Grange family from Ontario. "The Grange family are here at the show and I am delighted with the success of Farona, who took the Mount Juliet speed event on Saturday and the Qatar speed on Sunday. "She is incredible, having won both the six year old and seven year old finals in Florida and now upgrades to 1m 60 level. She will return to rest in Toronto before taking on the next circuit in Florida." Former world, European gold and Olympic champion Jeroen Dubbeldam, trainer and mentor to Coyle, was with him on Sunday when he won his fourth class on the Chippendale mare Legacy, having won on Wednesday with Tienna. "My owners bought Legacy from Jeroen's girlfriend Annaliese," Daniel explained. "I tried this horse in the Netherlands and recommended we buy. "She has been exceptional, winning international seven and eight year old classes on her first big outing. Jeroen came and prepped me for the class, since I only started to ride the mare when I came to Europe en route to Dublin. Winning in Dublin is like no other experience and returning here as a top 30 world ranked rider"
Sunday's six and seven year old national title went to Robyn Moran with Colesgrove Cavalier, closely followed by Dromore's John McEntee on Brooklyn du Granit, owned by Dermott Lennon. The brilliant Drumquin ridet, Jennifer Torrens, finished sixth overall on WKD GI Joe. Torrens later went on to win the junior equitation final and overall championship with McDappled Dream. After two pony wins on Fireman, Omagh's Niamh McEvoy partnered Charlton Chloe to win the Children on Horses final in Simmonscourt. Her jump off time of 33.26 clinched the final over Aoife Drea on Sandballin. Moy's Jemima Heffron had a team win in Children on Horses while Lucy Morton, from Portadown and Niamh McEvoy were both members of the second placed team. Saturday's Land Rover Puissance saw three Irish riders and a Brazilian share the competition having jumped to five rounds at 2m 25. Having all faulted in the fifth round they decided to share the prize fund. Padraic Judge and Citi Business, Richard Howley and CMS Tallulah and Michael Pender with Hearton, for Ireland, shared with Brazilian Pedro Junqueira. Pedro dedicated his win to the memory of the late Andres Rodrigues from Venezuela who won the competition four years ago but died two years ago in a car crash. "He was my brother, my friend and I think about him every day. He drove me to succeed and it was like being a soccer star in this great arena, I won this for him." Sunday's 200,000 Longines Grand Prix of Ireland went to Kevin Jochems on Captain Cooper, who was one of seven clear rounds who jumped off for a first prize of 68,000 euro. Bertram Allen was best of the Irish in fifth in the Grand Prix for 12,000 euro on his mare Molly Malone. Kevin, who won the Hickstead Grand Prix with Captain Cooper, said: "The course had big fences, it was very long, but my horse was amazing. I heard a lot about this show and all of it was true. I walked the course and knew it asked a lot." Leading national and international rider Darragh Kenny added: "The Grand Prix was very tough, but Alan Wade did a super job."